Џон Грифит (енгл. John Griffith Chaney; Сан Франциско, САД, 12. јануар 1876 — 22. новембар 1916) је био амерички писац познат као Џек Лондон (енгл. 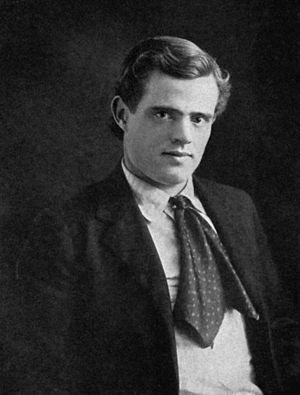 Jack London), један од најчитанијих у првој половини 20. века. Рођен је као ванбрачни син самозваног „професора“, писца и астролога В. Х. Ченија, који га никада није признао. Написао око 50 приповедака и романа, најпознатији Зов дивљине и Бели очњак и аутобиографски роман Мартин Еден (1909). Говорио је o животу радничке класе, са изразито социјалистичком тенденцијом. Често је описивао људе са дна, потлачене и понижене и зато је назван „амерички Горки“. ^ Мала школска енциклопедија. 1939. 2008. ISBN 978-86-331-2950-3. стр. 13. pp. 158. ^ The Jack London Online Collection: Writings. Day, A. Grove (1996) . „Jack London and Hawaii”. Ур. : Dye, Bob. Hawaiʻi Chronicles. Honolulu: University of Hawaii Press. стр. 113—119. ISBN 978-0-8248-1829-6. Kershaw, Alex (1999). Jack London. New York: St. Martin's Press. ISBN 978-0-312-19904-3. Kingman, Russ (1979). A Pictorial Life of Jack London. New York: Crown Publishers, Inc. (original); also "Published for Jack London Research Center by David Rejl, California" (same ISBN). ISBN 978-0-517-54093-0. London, Charmian (2003) . The Book of Jack London, Volume II. Kessinger. ISBN 978-0-7661-6188-7. London, Jack; Taylor, J. Golden (1987). A Literary history of the American West. Fort Worth: Texas Christian University Press. ISBN 978-0-87565-021-0. Lundberg, Murray. „The Life of Jack London as Reflected in his Works”. Explore North. Архивирано из оригинала на датум 10. 6. 2008. Reesman, Jeanne Campbell (2009). Jack London's Racial Lives: A Critical Biography. Athens, GA: University of Georgia Press. ISBN 978-0-8203-2789-1. Stasz, Clarice (1999) . American Dreamers: Charmian and Jack London. toExcel (iUniverse, Lincoln, Nebraska). ISBN 978-0-595-00002-9. Stasz, Clarice (2001). Jack London's Women. Amherst, MA: University of Massachusetts Press. ISBN 978-1-55849-301-8. Wichlan, Daniel J. (2007). The Complete Poetry of Jack London. Waterford, CT: Little Red Tree Publishing. ISBN 978-0-9789446-2-9. „Jack London's death certificate, from County Record's Office, Sonoma Co., Nov. 22, 1916.”. The Jack London Online Collection. 22. 11. 1916. Приступљено 14. 8. 2014. „Revolution and Other Essays: The Yellow Peril”. The Jack London Online Collection. Архивирано из оригинала на датум 11. 12. 2012. Приступљено 14. 8. 2014. „The Unparalleled Invasion”. The Jack London Online Collection. Приступљено 14. 8. 2014. Tennant, Roy; Stasz, Clarice. „Jack London's Writings”. The Jack London Online Collection. Приступљено 14. 8. 2014. Jacobs, Rodger (1999). „Running with the Wolves: Jack London, the Cult of Masculinity, and "Might is Right"”. Panik. Приступљено 14. 8. 2014. Williams, James. „Jack London's Works by Date of Composition”. The Jack London Online Collection. Приступљено 14. 8. 2014. Asprey, Matthew; Jacobs, Rodger (2010). Jack London: San Francisco Stories. Sydney: Sydney Samizdat Press. ISBN 978-1-4538-4050-4. Haley, James L. (2010). Wolf: The Lives of Jack London. New York City: Basic Books. ISBN 978-0-465-00478-2. Hamilton, David (1986). The Tools of My Trade: Annotated Books in Jack London's Library. University of Washington. ISBN 978-0-295-96157-6. Herron, Don (2004). The Barbaric Triumph: A Critical Anthology on the Writings of Robert E. Howard. Wildside Press. ISBN 978-0-8095-1566-0. Howard, Robert E. (1989). Robert E. Howard Selected Letters 1923–1930. West Warwick, RI: Necronomicon Press. ISBN 978-0-940884-26-7. Labor, Earle (1994). The Portable Jack London. Viking Penguin. ISBN 978-0-14-017969-9. London, Jack; Strunsky, Anna (2000) . The Kempton-Wace Letters. Czech Republic: Triality. ISBN 978-80-901876-8-9. Pizer, Donald (1982). Jack London : Novels and Stories. Library of America. ISBN 978-0-940450-05-9. Pizer, Donald (1982). Jack London: Novels and Social Writing. Library of America. ISBN 978-0-940450-06-6. Raskin, Jonah (2008). The Radical Jack London: Writings on War and Revolution. University of California Press. ISBN 978-0-520-25546-3. Sinclair, Andrew (1977). Jack: A Biography of Jack London. United States: HarperCollins. ISBN 978-0-06-013899-8. Starr, Kevin (1986) . Americans and the California Dream 1850–1915. Oxford University Press. ISBN 978-0-19-504233-7. Џек Лондон на Викимедијиној остави.